Worship is one of the most vast and deep-running genres in CCM. The possibilities of material is endless and new material is constantly being released. Some of the biggest artists in Christian music release worship music and we can thank Petra for getting the ball rolling with mainstream artists creating worship albums. In the 2000’s, Newsboys continued the tradition set by Petra and Sonicflood by releasing Adoration and Devotion and now we have Zealand Worship- a project put together by former Newsboys member and mainstay Phil Joel and it’s one that you have to check out if you’re a fan of the Newsboys worship music, Sonicflood, Passion or Hillsong. Short but sweet and sitting at just six songs, it’s a strong album. Some of the tracks could easily be played in worship services around the country but would also fit well in arenas at the same time. Songs like “You Awaken My Soul” and “Good Good Father” are anthems on their own while other songs like “That’s Who You Are” are inspirational as the rest of the tracks. 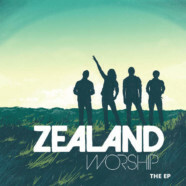 In the end, Zealand Worship have put together an EP and album that stands the test of time and shows they have the potential to be one of the worship powerhouses.